Have you heard about the hottest trend in DIY home décor and crafts? Come see Chalk Couture in action at University Pickers on Saturday, May 11th! “Dirt Road Blessings” and “Rusty, Repurposed, and Recycled” would like to invite you to their Chalk Couture Pop Up Shop/Open House inside the University Pickers Private Classroom. 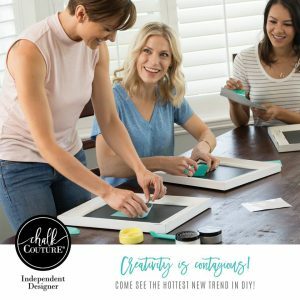 Stop in anytime from 9 am – 4 pm and check out beautiful finished projects, try it out for yourself at our Create and Take areas, and shop for any Chalk Couture products you need to create your own décor! New items from the Spring/Summer Catalog will be available on site for purchase. Refreshments will be served, kids are welcome, and smiles are free! Bring your girlfriends and learn about a new way to decorate your home.